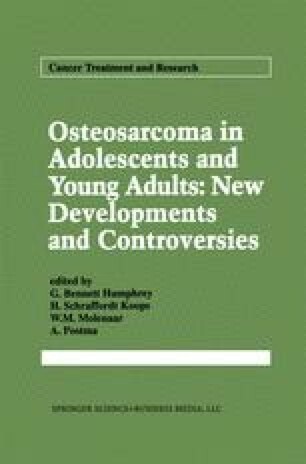 Is there a rational role for radiotherapy in the treatment of osteosarcoma? Up to 1974, The therapy of osteosarcoma consisted of surgery and radiotherapy. With amputation alone, 25–30% of patients could survive for 2 years and 80% of all patients died of distant metastases up to 15 years after the diagnosis . According to Cade , local radiotherapy with 7000–8000 cGy was given and the operation was deferred by 6 months in order to obviate unnecessary amputations in patients with distant metastases occurring in these 6 months. A 5-year actuarial survival of 21.8% can be achieved with radiotherapy and delayed surgery. Because of effective prophylaxis or treatment of metastases with methotrexate , radiotherapy has since been replaced by even more effective chemotherapy schedules, and therefore in subsequent years radiation therapy was omitted and was only used palliatively or in the rarer locations in the pelvis and the visceral cranium, as well as in elderly patients.